Guaranteed Rate, one of the ten largest retail mortgage lenders in the nation, received more recognition for its innovative, creative corporate headquarters this week. Crain's Chicago Business included the roof deck at the company's headquarters in its Oct. 20 print edition as part of a special feature on the city's coolest office spaces. "From client parties at sunset to employee yoga, Chicago companies found plenty of reasons to invest in rooftop enhancements this past year," the publication wrote. The Guaranteed Rate space was cited as one of the "functional designs that caught our eye." 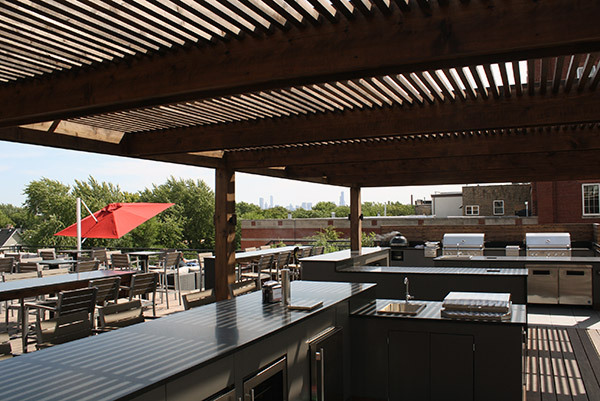 The roof deck, fully appointed and featuring breathtaking views of the city skyline, is just one of a number of perks for Guaranteed Rate employees in Chicago, who enjoy a fun and engaging company culture. The company headquarters housed in a restored timber loft on the city's North Side also features a corporate chef, an on-site fitness center and nurse practitioner, along with easy access to the city's mass transit system.